The Katie Jig is another in a line of dovetail jigs that clamp onto the board being cut (rather than clamping the jig to a bench top and inserting the board into the jig). The Katie Jig has a few features that separate it from other jigs of this style. It has variably spaced pins, has some handy edge stops, does not require the woodworker to install any backer boards (they come installed) and can be used on either a router table (with optional handles) or with a handheld router. While the documentation is in need of some improvement, the tool is very well-built and produces beautiful dovetails. The optional Dovetail Toaster is a clamping system to hold the jig to the stock and is an excellent addition. Although the jig is relatively narrow, two jigs can be clamped together for a full 26-1/4" cutting width. Can clamp both the tailboard & pinboard to the jig simultaneously, but different bits are required for each side. Edge stops for both sides of the stock helps make duplicating cuts a simple procedure. Fingers and spacers are easily adjusted with an Allen wrench (included). Owner's Manual has a few images but could use better focus. It took some trial and error to get the hang of the jig. The Katie Jig is a perfect example of a tool that doesn't seem very impressive out of the box but becomes far more impressive the more you use the tool. On the surface, the owner's manual seems fine, but some more images that show the specific item that the text is referring to would be a big help. The steps for routing the dovetails was thorough enough, but the steps for initial setup of the jig could use some revising. That being said, once we got the unit set up and figured out exactly how to use the dovetail jig properly, we thoroughly enjoyed using the Katie Jig. The adjustable fingers give the jig more versatility that some other similar models and the edge stops that connect to the bottom of the jig on each side of the stock make cutting multiple pieces a very simple process. Where we really fell in love with this dovetail jig was when I installed the optional Dovetail Toaster system. The Dovetail Toaster is a clamping system that holds the stock in place on the jig, eliminating the need for small clamps to hold the stock. 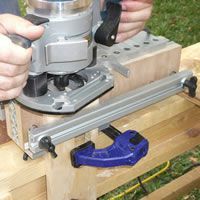 This clamping system is very similar to the bars that hold the stock on bench-style dovetail jigs, but has an advantage in that it only takes one hand to clamp the boards onto the jig - gravity holds the boards in place while you tighten down the clamp bar. In a perfect world, we'd love to see the manufacturer precisely pre-drill the backer boards to accommodate the bolts for the Dovetail Toaster, but it is not difficult to remove the backer boards and drill them yourself (although they do need to be drilled accurately). We'd also appreciate a DVD showing how to set up and use the jig, which would alleviate a lot of the documentation concerns I mentioned.